Convenient parking is available near the Phoenix Wells Fargo History Museum at the following locations. Click on the map shown below for more information on parking. 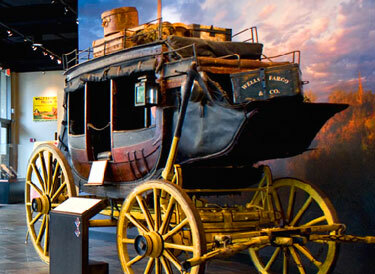 The Wells Fargo History Museum is located in Wells Fargo Plaza and features an extensive collection of western-themed art depicting Wells Fargo's role in the mines of Arizona. Exhibits include an authentic 19th Century stagecoach, a replica stagecoach that visitors can climb, an interactive telegraph, and an art gallery featuring the largest public display of N.C. Wyeth's artwork. Nearby are many diverse attractions including the Orpheum Theatre, Symphony Hall, Comerica Theater, Phoenix Police Museum, historic Heritage Square, Arizona Science Center, Phoenix Convention Center, Arizona State University, US Airways Center and Chase Field.